Fort Dobie (1863-Unk) - Established in 1863 as a fortified dwelling, way-station and stage stop along Skinner's Toll Road. Also locally known as Innskip Station and Ruby Ranch. Established as a fortified dwelling and way-station in 1863 by Dr. E. W. Innskip and his partner Osgood on Skinner's Toll Road. Served as a refuge for travelers and settlers during Indian raids. 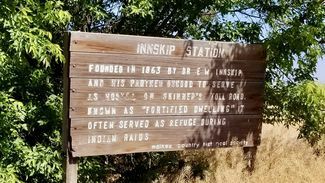 Innskip Station was built of lava rock with gun ports in all the walls and great fireplaces to heat the rooms. As a way-station for travelers and stage coaches along Skinner's Toll Road, it had separate parlors for men and women and in the men's parlor it offered the only bar along the road. Stage coach travelers received food and rest while the teams were changed. It continued to operate as a way-station for some 50 years under a number of owners and the ruins now occupy a fenced off area on a working ranch. Jean Baptiste Charbonneau the son of Sacajawea, born at Fort Mandan on the Lewis and Clark Expedition in 1805, died here enroute to the Montana gold fields on 16 May 1866 and is buried nearby. Some ruins and a marker enclosed in a fenced compound next to a working ranch. Nearby is the grave of Jean Baptiste Charbonneau (1805-1866) the son of Sacajawea, born on the Lewis and Clark Expedition. Jean Baptiste died at Innskips Ranch in 1866 and is buried nearby. 1. The Fort Dobie name for this location comes from the GNIS database which cites an obscure drainage map reference, may not be accurate. 2. Other locations claim to be the burial site of Jean Baptiste Charbonneau including Fort Washakie, Wyoming. Location: Just north of Danner on the old Ion Highway in Malheur County, Oregon. Follow the signs to the Jean Baptiste Charbonneau gravesite.